The Rugby World Cup is only weeks away, but teams are still playing some warm-ups – and there have been some casualties! Here’s quick summary of the matches from this weekend. A match between the 6 Nations Champions of 2015 – Ireland – and the close runners up, England, it was always going to be an intense match. Both teams announced their World Cup line ups this week, so they were playing with their full squads. It was a tough match, but England were looking far stronger than the disorganised team they were against France the previous weekend. Jonathan Sexton, one of Ireland’s stars, seemed to have trouble with cramps at one point, but remained on the pitch and a threat to England’s attacks. Ireland: O’Connell – Try. Sexton – Converted the try, kicked 2 penalties. England: May, Watson – Tries. Ford – Converted first try. Ford, Farrell (2) – Penalties. Wales may have won but they suffered serious losses when Leigh Halfpenny and Rhys Webb – two of their most prominent players – went off with knee and ankle injuries. There have been no official reports yet but due to Halfpenny having been stretchered off the pitch and Webb’s obvious pain, Wales’s chances at the World Cup could be looking damaged. They are also in one of the toughest pools – facing England, Australia and Fiji. The match was a little messy, but Italy played better than they had during the 6 Nations tournament this year. A close match, where Scotland proved they were still capable of playing well after their ‘Wooden Spoon’ act in the 6 Nations – where they lost every match. The discipline on either side wasn’t great, but it was a good match. Scotland held out really well, and France took the lead when the Scots threw a bad line-out. Overall, progress from both sides, but Scotland looking much better for the world cup. 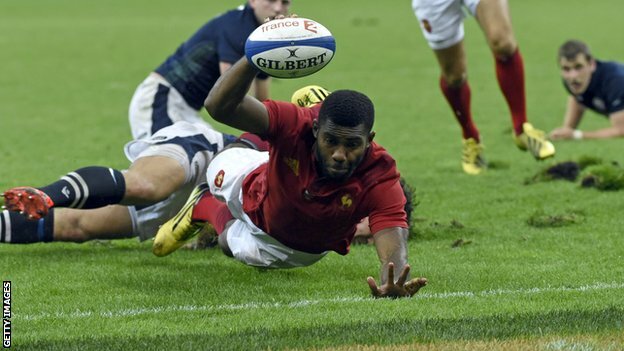 France: Nakaitaci – Try. Parra – Conversion. Michalak (3), Spedding – Penalties. Scotland: Seymour – Try. Laidlaw – Conversion. Laidlaw (3) – Penalties. Thanks for reading! We’ll be keeping you posted during the 2015 World Cup in England! Posted in Sports and tagged ecolint, la chat, newspaper, Rugby World Cup 2015, the update. Bookmark the permalink.